The Peregrine Falcon is famous for being the fastest bird in the world (although it isn;ty because the Rufous Hummingbird is actually faster, but less impressive). When in pursuit of prey, it can reach speeds of over 200 mph! It also can be found nearly everywhere on Earth, with the exception of New Zealand and Antarctica! Unfortunately, in eastern North America, it wasn't able to escape the effects of the pesticide DDT and was exterminated in this region by 1965. Historically in Tennessee, there were approximately 25 eyries (falcon nest sites) located in the eastern mountains, with a few nest records from the northwestern part of the state. By the late 1940s, there were no known active eyries. Curiously, the decline in Tennessee happened a couple of decades before DDT was introduced into the environment, and the reason for their local extirpation is not known. In the early 1970s a technique was developed called "hacking," where fledgling-aged captive bred Peregrines were released into historic breeding areas. From 1984 to 1993, 44 young Peregrines were released from 4 sites in Tennessee. In 1997, the first successful breeding pair was recorded in the state. Currently (2009-2013) there are 1-2 active eyries, both in Great Smoky Mountains National Park and in Tennessee. The Peregrine Falcon winters through most of its breeding range, retreating from the northernmost areas. It can be found in Tennessee during any season, but is never common. Description: The Peregrine Falcon is a medium-sized hawk with a bold black "mustache" mark on the face and white cheeks behind the black mustache. The wings are long and pointed, the back and wings are bluish gray, the head is blackish. The underparts are whitish with a variable amount of black spotting and barring. First-year birds are brown with streaking on the breast and have the bold mustache mark. As with other bird-eating raptors, the female is larger than the male. American Kestrels are much smaller, have a double facial stripe, and are rusty on the back. Merlins are smaller and slimmer, with only a very weak facial stripe. Habitat: Found in a variety of open habitats, including along lakes, rivers, mountain cliffs, and bluffs. Occasionally found in large cities. 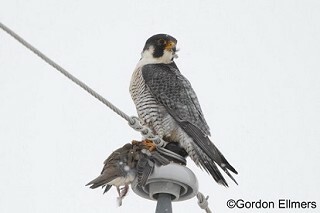 Diet: Peregrine Falcons mostly eat birds, from songbirds to small geese, but also bats and other small mammals. They favor shorebirds and pigeons in Tennessee. Nesting and reproduction: Nest sites, or eyries, can often be found by whitewash on the ledge that the nest is on. This whitewash is excrement produced by both adults and young. Eyries are usually used for many years. Clutch Size: 2 to 5 eggs. Incubation: The female does most of the 4 weeks of incubation. Fledging: Both parents feed the young, which fledge in 6 to 8 weeks, and remain dependent on the adults for another 2 months or more. Nest: The nest is a shallow, unlined scrape in the loose material of a cliff or building ledge that has a protective overhang. Old raven and hawk nests are sometimes used, and rarely the cavity of a large tree (historically in northwest TN). Sites are usually high, 100 feet or higher, with a commanding view. Status in Tennessee: From the late 1940s until the late 1990s there were no known successful nesting pairs of Peregrine Falcons in Tennessee. The first successful nest was in 1997 at the eyrie on Alum Cave Bluff in Great Smoky Mountains NP. There are currently 2 active eyries in the state, both in Great Smoky Mountains NP. A third eyrie, on a railroad bridge below Chickamauga Dam in Hamilton Co., was active for many years, but abandoned when the breeding male died in 2007.The Peregrine Falcon was removed from the federal list of Endangered Species in 1999, but remains listed as Endangered in Tennessee. The name "peregrine" means wanderer. Not only do Peregrine Falcons nest nearly all over the world, but birds nesting in the Alaskan tundra winter in South America, an annual migration of 15,500 miles a year! This is one of the longest migrations of any North American bird. Since before Medieval times, Peregrine Falcons have been a favorite species among falconers for hunting. Methods developed by falconers for handling captive falcons proved important in the development of a captive breeding population. When DDT caused populations to crash in 1950 to 1970, the Peregrine Fund released more than 4,000 captive-reared birds in 28 states over a 25-year period. Successful breeding by these released birds allowed the species to be taken off the federal Endangered Species list in 1999. DDT caused reproductive failure among many species of birds and especially birds of prey. This pesticide caused females to lay thin-shelled eggs that were easily broken, killing the developing embryo inside. DDT was banned in the United States at the end of 1972, and since then, many species have recovered. The Peregrine Falcon's average flight speed is 25 to 34 mph, reaching 69 mph when in pursuit of prey. However, when diving towards its prey, this falcon can reach speeds of 200 mph, making it the fastest bird in the world. 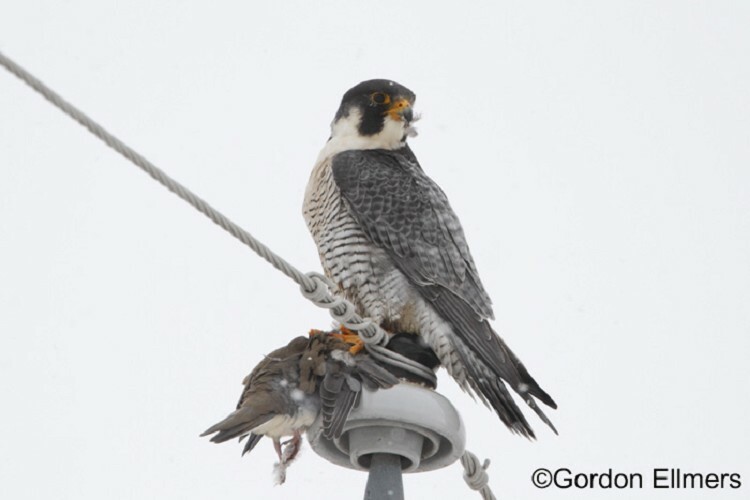 Unlike most birds of prey, Peregrine Falcons have adapted to living in many cities. Not only do cities offer tall buildings with ledges for nesting, but large populations of pigeons and starlings provide plenty of food. Best places to see in Tennessee: The best time to see migrant Peregrine Falcons is from late September to early October, especially on the Cumberland Plateau, the eastern mountains, and along the Mississippi. A nesting pair can often be seen on the Alum Cave Trail, in Great Smoky Mountain National Park. Falcon Research Group, including satellite telemetry study. TWRA falconry web page, including proclamation about how peregrine take would be handled in Tennessee.